Outdated: This page is no longer an accurate representation of the current version of MatterControl and needs to be updated. This page contains outdated information and is kept only for historical reasons. For up to date information on MatterControl 2.0, visit the new MatterControl documentation. 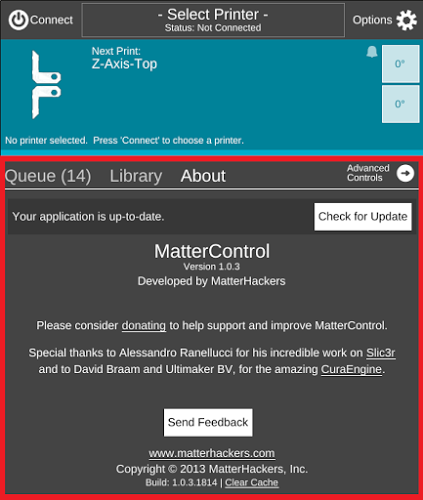 The About section is located to the right of the Print Queue and Library on the MatterControl home screen. This is a space to check for updates, send feedback, clear the cache, and view documentation related to the software. This page was last modified on 15 November 2016, at 17:13.